This course is for the novice user who has little or no experience with Microsoft Excel. We will begin by learning about the parts of the Excel interface, including the Title Bar, window control buttons, File menu, and more. You will learn about the new Ribbon, the different tabs, groups, command, and dialog menus. Next you will learn about the Quick Access Toolbar, the status bar, zoom controls, and scroll bars. 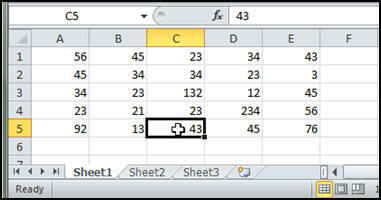 We will next learn about the Formula Bar, the different parts of a spreadsheet including rows, columns, and cells. You'll learn how to use the mouse pointer with respect to Excel, and learn about the different Sheet Tabs. You'll learn how to properly input data into an Excel spreadsheet. We'll create a sales summary sheet in class with different sales reps and their sales figures by month. You'll see how to work with both the mouse and keyboard. We'll learn how to edit data in our sheet. 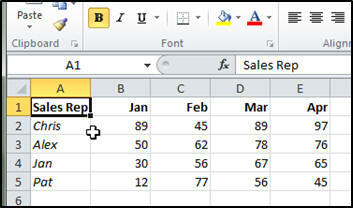 You'll learn how to replace data in the cells, edit data using the Formula Bar, and use Edit Mode directly in a cell. You'll also learn about Undo and Redo. You will learn how to format your spreadsheet to make it look more professional. You'll learn about cell alignment, ranges, bold, italics, underline, and more. Next we'll learn more formatting techniques. You'll change the font and font size. You'll learn how to resize columns and rows, change color, and more. 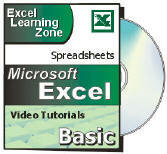 You will learn how to perform basic math calculations in Excel, and how formulas work. You'll learn about the basic math operators (add, subtract, multiply, divide, exponent) and how to use constants in your formulas. We'll learn how to add multiple cells, use the mouse to build our formulas, work with the status bar, calculate an average, and we'll learn about the all-important Order of Operations. Finally, you'll learn how to save, load, and print your worksheets. You'll also learn about pinning your files to the Recent Documents menu, and previewing your sheet before you print it. Again, this is the perfect class for anyone who is new to Microsoft Excel 2010. If you have little or no experience with spreadsheets, or you just want to get familiar with how Excel 2010 works, this class is for you. You should have some basic knowledge of Windows beforehand, and a little bit of Microsoft Word helps (so you're familiar with formatting text), but we'll teach you everything you need to know to use Excel to make simple spreadsheets. Lynn Robbins on 12/21/2010: I enjoyed the excel 2010 beginner course. bill ritchie on 1/8/2012: lesson 11 stops at 3:59. Annie Kingi on 2/13/2013: Thank you very much for your course, very informative and easy to follow along. Susan on 11/25/2013: How to print when part of the work is out of the page? Normand J Caron on 2/18/2014: I really enjoyed this course. I was able to create a sample spreadsheet with colors, highlight, bold and underline. Richard is an excellent instructor. teresa hajek on 5/23/2014: gust want I needed. looking forward to more lessons. teresa hajek on 5/23/2014: perfect lesson for first time users with excel. I look forward to other lessons. Julie Martin-Beaulieu on 7/16/2014: I am using excel 2013, will this apply? Yep. The two versions are almost identical. Alonzo Dumas on 1/7/2015: Is there a online tests after each course? There used to be a system for Tests but it's currently being redeveloped. Would you find something like this useful? What would you want it to be like? You can order any courses using the order form. You can select or scrub to any part in the video. Richard Mumba on 11/15/2015: I like the course so much it has really jam started me. There are many videos for many programs, which program do you want to learn? SIMPLICE ZIRIGA on 1/16/2016: hOW LONG DOES IT TAKE TO ACCESS THE COURSE WHEN YOU JUST PURCHASED IT. IT MAKES ME REALLY MAD THE WAITING TIMES TO ACCESS A COURSE THAT IS ALREADY ONLINE. There was a short outage at the weekend that may have delayed the time it became available. samuel campbell on 3/11/2016: I wish to take Excel beginner lesion 2 would I be able to revert back to lesion 1 for memory purposes? Any courses you have purchased will be available in the theater so you can watch as many times as you'd like. Chris Knapp on 2/6/2017: I purchased Excel12010B1 and the handbook but I'm only able to view the intro video before I'm directed to a blue screen telling me to purchase the class that I already have. I've logged on and off and closed my browser numerous times and sent two customer service emails without a response. Was the email you purchased it with the email you are logging in with? Did you get a confirmation email with the order? samuel campbell on 10/1/2018: I believe that I need some of the WORD classes to learn how to create folders etc. How do I get started on that? my last job required me to make daily reports and place them into folders with pictures taken daily. I could not and lost the job. This is more a WINDOWS thing, have you taken any of those courses?